On this project, our client was the Matron of Meadow House Hospice, which is an NHS facility for the terminally-ill. Their relatives' room is in use 24hours, 7 days a week, by the families and friends of patients. 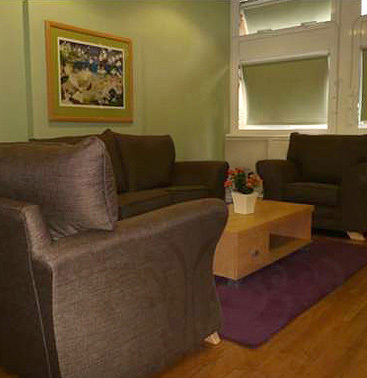 Located in Ealing Hospital, Meadow House Hospice, is a busy part of this hospital in Greater London. We were asked to create a relaxing, restorative environment with a home-away-from-home feel. We were also charged with restyling the kitchenette and providing practical storage that would be safe and secure. In taking advantage of our project management service, we were required to ensure that the nursing staff could continue with their duties un-interrupted. The client also specified that particular emphasis should be placed on colours that would create the feeling of relaxation and restoration. As an NHS facility, the budget had to be strictly adhered to, and we were also required to pass checks that would place Karen Haller Interiors on the NHS approved suppliers list. "The visitors find the space relaxing and comfortable, putting them at ease when they are visiting their relatives and loved ones"
After an initial consultation, we created the design and Harmonious Colour Palette. As project managers, we then went through a competitive tender process to select a builder selected who was able to fulfil the brief within a very quick turnaround time of only 5 days. The existing kitchenette was reconfigured to be easier for visitors to use and provide much needed storage space for the staff. A roll down shutter was also installed for safety. A new breakfast bar style eating area was created to leave space for those who wanted to relax on the lounge and read or watch television. Along with new flooring and external windows, all the furniture and window coverings were replaced. These were required to meet stringent NHS Health & Safety requirements. Low VOC (Volatile Organic Compound) paint was selected to minimise toxic fumes which linger long after the smell has gone. Despite the small size of the room, our finished design gave a spacious, airy, uncluttered look, giving a light and airy feel to the room. The Harmonious Colour Palette used was the lighter muted end of the Autumn range, including warm, yellow based colours with a touch of black. This colour Palette was chosen to feel safe, secure, nurturing, welcome, restful, and inclusive. The refurbishment was carried out with minimal impact to the patients, relatives, visitors and staff with all work being undertaken with the understanding and sensitivity that the hospice was in use day and night. Added to this we brought the project in under budget as well - saving the hospice £5000 that they were able to redirect to other resources. Learn more about how colour psychology can work in your business environment.